In a last attempt to stop the French from using their Veto at the UN Security Council’s vote on Iraq George W. Bush and Tony Blair slipped a laxative into the French Representative’s drink minutes before the voting took place. 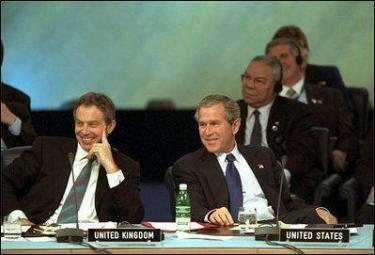 The reaction of George W. Bush and Tony Blair after the French Minister started to feel ill at the United Nations. Unfortunately, they were too busy laughing at the incident that they too missed the vote and as a result the motion was abstained. Bush can Name All Enemy Nations – but can he spell them?